Wow, summer in Portland, Oregon feels goooood. I returned to Portland for another work trip, and this time I was able to spend time with friends here and enjoy the town a little more. 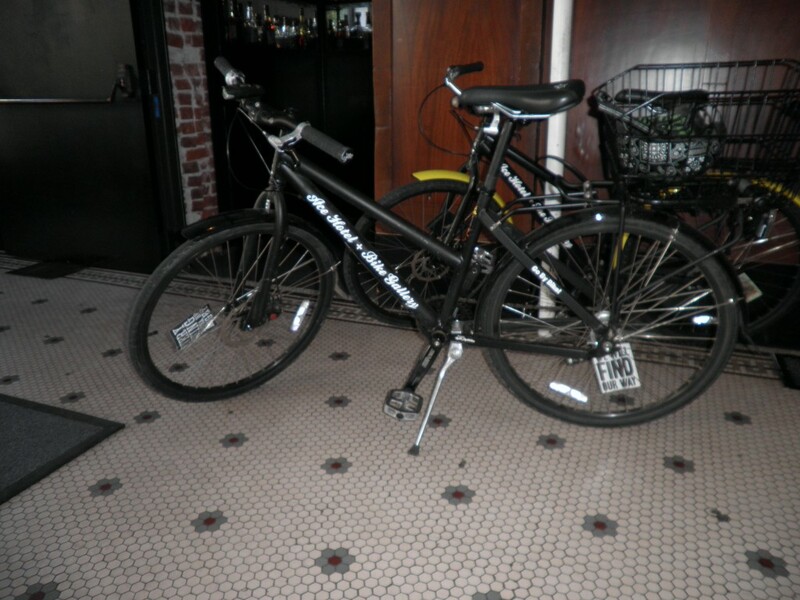 I stayed in the Ace Hotel, which has bikes available free for guests! Needless to say, I took full advantage of that perk. I acquired a pretty wild steed with a coaster brake. It took me a while to figure that one out. I rode around for a minute the day after I arrived, and then the next day it was an all afternoon/evening affair. There are many different styles of accessible bike routes around town, and here’s a few that I experienced. First would be the full bike lane. This was right by the hotel, and it was awesome. I’m sure drivers aren’t too happy about it, but who cares about them? I love love loved it. This would be more of a bike route. Cars can drive on the lanes, but I take the bike symbol to mean, “hey bikes, do whatever the hell you want to!”. There were also speed bumps every few meters to reduce car speed. A transplant friend from Birmingham who rode around with me one night said that this prevents many cars from driving on these roads at all. That made me happy. 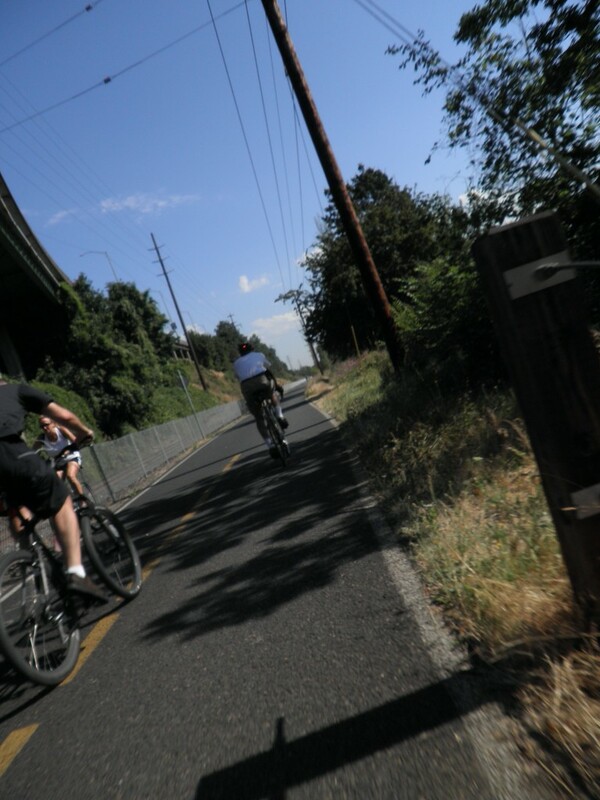 Here would be the Springwater Corridor, a bike/pedestrian path. I rode on this around the end of the work day on Friday, so there were a ton of people out riding. It was great seeing all the different types of riders that make use of this path. I enjoyed this path while going to check out a bike shop that carries a frame I’m considering purchasing for Cyclocross, by Traitor Cycles. The shop was right off the path – a small business with the owner and one other guy wrenching and hanging out. Lovely! The bikes were brilliant. I was also told to go check out another shop on the other side of the path because they carried Vanilla and Sweetpea bikes, so I headed over there next. Unfortunately I didn’t find either of those at the shop, but it was a much bigger operation that was packed full of folks buying gear, checking out the awesome bikes, and getting work done. I was interested to see the many (and I mean many, there’s tons of shops in town) different styles of bike shops around. 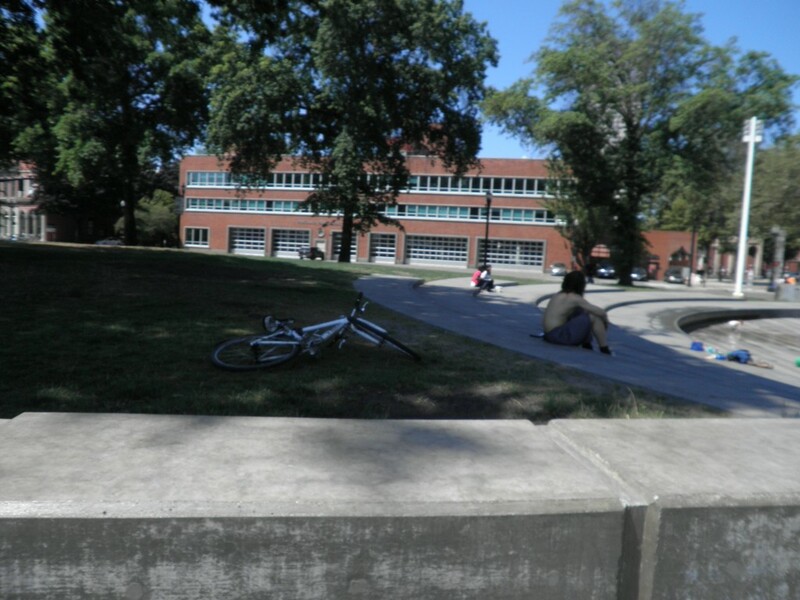 I also rode a bit on the Waterfront bike loop, another bike/pedestrian path. People everywhere were enjoying their bikes in the picturesque weather. These types of bike routes were mostly what I rode on. I wound up on a few larger roads that were a little intimidating, comparatively, but you know I’m not spoiled enough to have really been frightened. I actually enjoyed knowing that everywhere in Portland isn’t perfect. Who likes perfection anyway? Very much enjoy your posts. Please see http://www.seattle.gov/Transportation/sharrows.htm for a further description of the “sharrow” that is the road marking in your third photo. 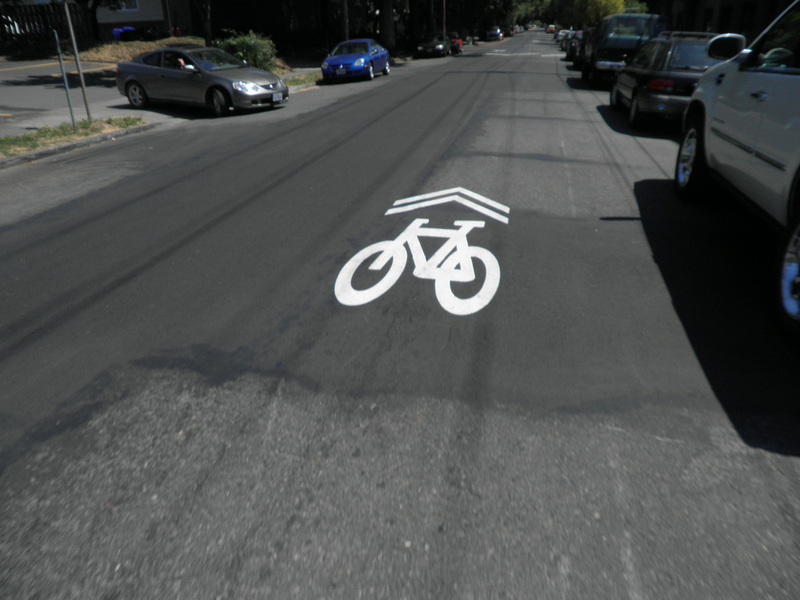 Not as good as a full bike lane, but nevertheless, still somewhat awesome. 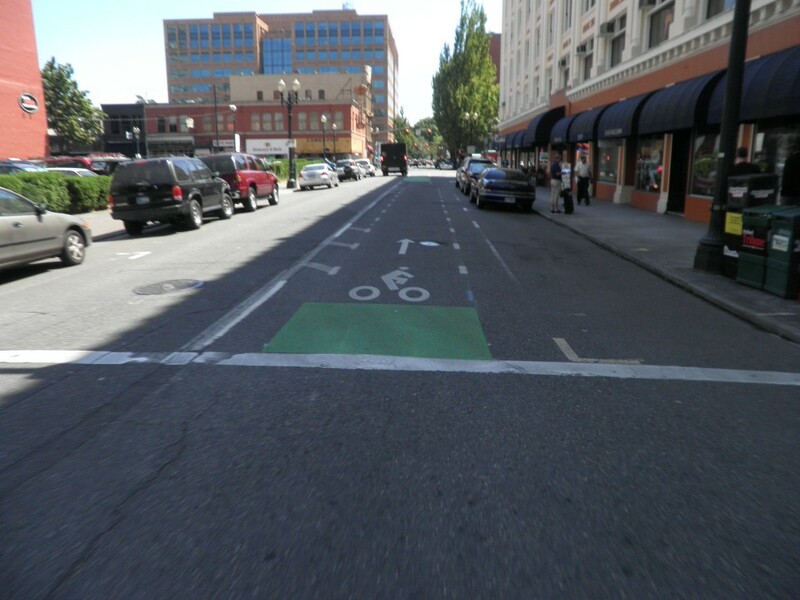 I think that the most remarkable thing about biking in Portland is that the vast majority of cyclists there obey the rules of the road and ride in a safe and predictable manner. Is it because they have decent infrastructure? Is it because the city shows them some respect? Or are they just more law-abiding than the average cyclist in Providence?